Is The Donald from Loompaland? 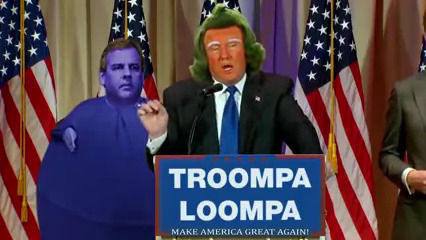 The Oompa-Loompas are from Loompaland, which Mr. Wonka describes as a terrible place. “Nothing but thick jungles infested by the most dangerous beasts in the world - hornswogglers and snozzwangers and those terrible wicked whangdoodles,” he tells Charlie Bucket and the other Golden Ticket winners. Loompaland is such a terrible place that when Mr. Wonka invited the Ooompa-Loompas to come back to his Chocolate Factory, they leapt at the chance. Now they live and work there, helping Mr. Wonka with his experiments, and generally keeping his Chocolate Factory going. The tiny Oompa-Loompas, with funny long hair, enjoy dancing and singing. Their favourite food is the cacao bean, the central ingredient in a bar of chocolate, and in the Wonka Factory they have access to as many cacao beans as they could possibly wish for.